Model Agency WordPress theme is suitable for showing profiles of female and male models. This responsive theme is also suitable for other kinds of websites that requires presentation of member profiles (agencies, teams, clubs, associations, societies, etc.). Model Agency WordPress theme supports use of WordPress custom fields, so you can create an overview of your models (or any other items) very easy. There are many widget positions available in the theme layout. This allows you to include many plugins and widgets on your site. Once again, we were led by the idea “make it responsive or don’t make it at all”. That’s why we developed a theme which allows a great user experience on all devices that your visitors may be using when accessing your site. 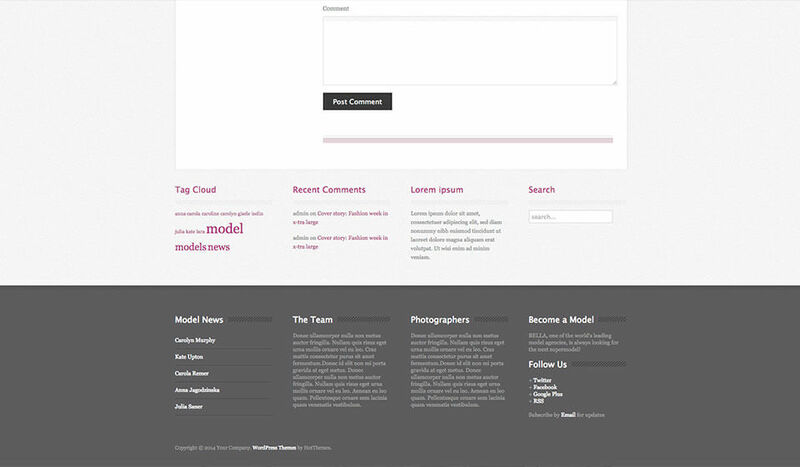 Model Agency WordPress theme is based on a valid HTML5 and CSS3 code. The widths of the left and the right columns are parametrized, as well as the overall theme width. So, you will have full flexibility regarding the site dimensions. Theme is compatible with WordPress live theme customizer. You can make changes in theme options and see the results live. Model Agency WordPress theme comes with several responsive plugins. Tge Hot Effects Rotator , Hot Film Tape, Hot Slicebox and Hot WordPress Gallery can help for making slideshows of images and text. Hot Maps can be used for adding Google Maps onto your site easier. Hot Model Agency is a responsive WordPress theme. This means it will look good and optimized on all desktop and notebook computers, as well as mobile devices (tablets and smartphones)!